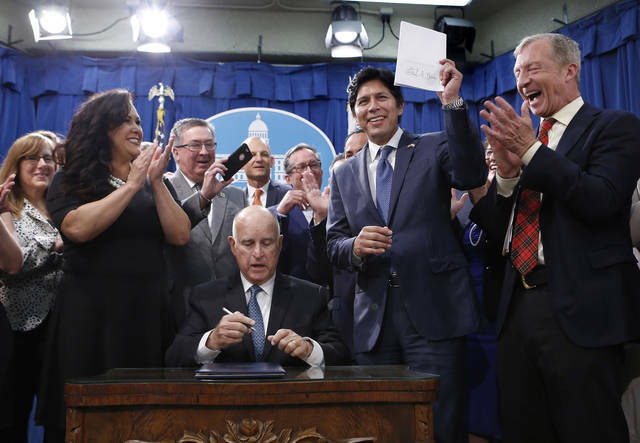 SACRAMENTO, Calif. (AP) — California has set a goal of phasing out electricity produced by fossil fuels by 2045 under legislation signed Monday by Gov. Jerry Brown, who said the policy should serve as a model for other states and nations. The state is pushing to rapidly expand adoption of electric vehicles and has created a “cap and trade” program to put a price on carbon emissions, creating incentives to reduce them. It’s working toward a goal to reduce greenhouse gas emissions by 40 percent over the next 12 years. The renewable energy measure would require California’s utilities to generate 60 percent of their energy from wind, solar and other specific renewable sources by 2030. That’s 10 percent higher than the current mandate. The goal would then be to use only carbon-free sources to generate electricity by 2045. It’s merely a goal, with no mandate or penalty for falling short. California’s renewable energy goal is not as ambitious as Hawaii, which has adopted a 100 percent renewable energy mandate. Brown advocates for a regional energy grid that would more easily allow Western states to share energy. 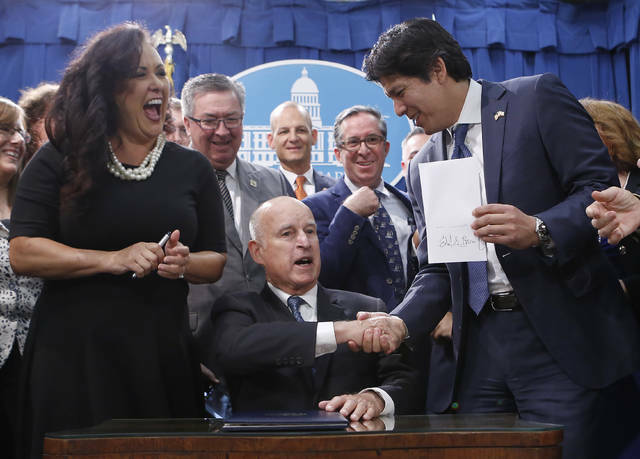 An effort he pushed has died the past two years in the Legislature, with critics arguing California shouldn’t be part of a grid with states that rely on coal. 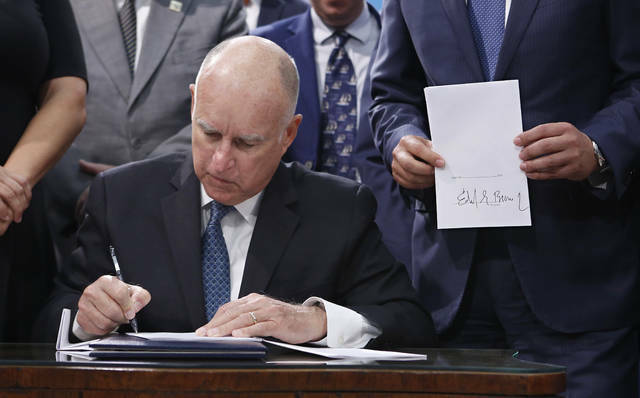 But Brown on Monday said moving toward a regional grid is essential to achieving California’s new 100 percent clean energy goal without sending electric prices skyrocketing. Business groups also opposed the measure amid concerns that it would raise the price of energy and, together with California’s other environmental and labor protections, make it hard to compete with firms in other states. Opinion: Who Needs Bipartisanship Without a Budget Constraint? In 2018, all federal appropriation bills (with bipartisan support) have passed out of their respective committees. Even more stunning, many of these bills have actually passed the House and Senate. No wonder folks in Washington are congratulating themselves en masse for avoiding continuing resolutions and other temporary funding measures. However, before we give Congress a standing ovation, we should note that this esteemed legislative body has yet to implement an actual budget. All of the appropriation bills include significant spending increases. Such is why total government spending will increase by a whopping 13 percent this year. Passing appropriation bills without a budget constraint is a pyrrhic victory. The bipartisanship in passing these appropriation bills is possible because legislators “compromised” on an additional $150 billion in spending. Republicans got the boost in military spending they wanted and Democrats received their quid pro quo in higher domestic spending. It is easy to compromise on appropriations when you borrow the money and pass the bill along to future generations. Simply put, the budget process is broken. For decades, Congress has incurred deficits and accumulated debt at an unsustainable rate. Republicans pay lip service to a balanced budget, yet they refuse modest spending reductions again and again. Democrats show little interest in even discussing deficits and debt. The few remaining deficit hawks, such as Sen. Rand Paul, are criticized for not participating in this fiscal charade. Continuing to incur deficits and accumulate debt is not sustainable in the long run. According to Congressional Budget Office forecasts, these fiscal policies will eventually be accompanied by retardation and stagnation in economic growth. At some point, a debt crisis is inevitable, accompanied by a collapse in international financial markets. The bad news is that this nightmare economic scenario is fast approaching. In a recent speech, former chairman of the Federal Reserve Ben Bernanke predicted that Wile E. Coyote (the U.S. government) would fall off the cliff in 2020. He was referring to the unwelcome return of trillion-dollar deficits that undermine monetary policies and wreak economic havoc. Whenever the debt bomb explodes, the outcome would be a global disaster. Just look at the fallout from the recent debt bombs in Argentina and Greece. Needless to say, the consequences of a debt crisis in the United States would dwarf those cases. The good news is that we do not have to watch Wile E. Coyote plummet off the cliff. In other words, we should not wait for credit markets to signal an unfolding debt crisis in the United States. By implementing common-sense fiscal rules, such as those enacted in Switzerland and other European countries, we can prevent a financial crisis and put the country on the path toward a sustainable fiscal future. The Swiss have a cyclically balanced budget, with deficit spending in periods of recession offset by surplus revenue in periods of rapid growth. With a cyclically balanced budget, the Swiss were able to pursue a counter-cyclical fiscal policy during the recent financial crisis without triggering an increase in debt in the long run. At this point, the United States is severely constrained in responding to external shocks and business cycles. It would be difficult for the country to pursue a countercyclical fiscal policy without triggering an explosive increase in debt similar to that during the recent financial crisis. Using debt to finance higher levels of spending, even when the funds are used to finance infrastructure investment, would be counterproductive because of the negative impact of debt on private investment. Increasing taxes to offset higher levels of spending is also counterproductive because of the negative impact on economic growth. However, with our proposed fiscal rules in place, debt levels could be reduced to a sustainable level, and the United States could then pursue a cyclically balanced budget. This would allow the fiscal flexibility to respond to external shocks and business cycle downturns. The government could pursue fiscal policies to stabilize the economy over the business cycle without triggering unsustainable deficits and debt. The country would also have more capacity to invest in infrastructure to promote economic growth. Even more stunning, the United States could deliver government services in the long run. Reforming entitlement programs will be essential in generating the savings required for a sustainable fiscal policy. However, the nation will still be challenged to meet the insatiable demand for pension and health benefits demanded by an aging population. When Switzerland enacted its fiscal reforms, its debt levels, relative to Gross Domestic Product, were well below that in the United States. After several decades of reckless spending, Congress has accumulated a $20 trillion debt, it is obvious that Americans face a daunting situation. The United States must enact more stringent fiscal rules than those employed in Switzerland. Policymakers may be surprised at the magnitude of the task, which will require difficult choices. The fiscal rules that we propose would require Congress to reach agreement on a budget consistent with a sustainable level of debt, at the outset of the budget cycle. Compromises in passing appropriation bills would require agreement on budget priorities consistent with this budget constraint. Living with a budget restriction requires real bipartisanship. State legislators have learned to live with a budget limit, and it is time for Congress to do so as well. John Merrifield is professor of economics at the University of Texas-San Antonio. Barry Poulson is emeritus professor of economics at the University of Colorado-Boulder. They wrote this for InsideSources.com. Steve Petsch receives funding from National Science Foundation. University of Massachusetts Amherst provides funding as a founding partner of The Conversation US. Jurassic, Pleistocene, Precambrian. The named times in Earth’s history might inspire mental images of dinosaurs, trilobites or other enigmatic animals unlike anything in our modern world. Labels like these are part of a system scientists use to divide up Earth’s 4.6 billion year history. The biggest divisions are eons which split into eras, which break into epochs, which divide into periods and then all the way down to ages. Officially, we’re living in the Holocene epoch. Informally, people talk about our current age as the Anthropocene, melding humans with the lingo of geologic time. And now, there’s a new age with a new name – the Meghalayan. So how did the custom of dividing and categorizing time get started, and who gets to decide when there is a new age, epoch or era? The big mental leap came in connecting rocks with time – those Devonian rocks were formed during what came to be called Devonian time. That’s how geologic time became a convenient shorthand for major events and changes in life’s history on Earth. The Cretaceous is not just chalk. It’s a time when conditions were just right for the seas to be filled with huge populations of plankton – whose bodies sank to the ocean floor and eventually formed chalk when they died. The history of Earth’s atmosphere is one example. Invisible chemical proxies created by ancient organisms and preserved in sedimentary rocks record the rises and falls in oxygen and carbon dioxide over the past 600 million years. These coincide with events along the geologic timescale such as major mass extinctions, the evolution of land plants and the assembly and breakup of supercontinents. Those first two are unusual because their type localities are not rocks. Instead, they’re layers of ice deep within the Greenland Ice Sheet. Both are defined by major, global-scale environmental change: warming in the case of the Greenlandian and ripple effects of melting ice sheets for the Northgrippian.